So far in our series of collecting our own fish, we have covered the introduction, which outlines some basic things you need to do and know about before getting started. We also covered how to buy, build and use catch buckets the fish will be put into, then the collection nets you need to catch the fish. Now you need a hand net or two to scoop the fish in when they are in the collection net area. Look for material that you feel will not cause scale damage. Be careful when purchasing nets that are advertised for use in sports fishing. These nets can look appropriate, but sometimes the material is course, made of nylon type material, and can cause a lot or scale damage. Look for a mesh (size of holes) that the fish will not go through or get caught in. Look for material that is soft and flexible. Look for easy to use handles. Can you attach it to a clip or rope line for easy storage while carrying it when not in use? In Hawaii, you can find basic find mesh red nets with wooden handles just about anywhere. They work well for using around your aquarium, for collecting inverts and smaller critters that might go through a larger mesh net. It also is a good net to use when exploring around tide pools. If collecting fish with this type of net, you will find the pocket too shallow and a fish will be in the net and out again before you can react. What you can do to improve the depth of the net is to buy two, cut the bottom out of one, cut the net off the hoop on the other and sew the two of them together, making a deeper pocket. Remember, the finer the mesh on your net, the slower it will move through the water and with a bright colored net (red) the fish can spot it and have a tendency to run away from it when they see it coming. We found the best hand nets we used were the ones we made ourselves out of 3/4 inch stretch monofilament net material. This is the same material we make our collection nets out of. Monofilament net material will become stiff and scratchy after prolonged exposure to saltwater and needs to be replaced periodically. With this material it moves through the water quickly, and because it is opaque, the fish cannot see it very well. Here is what you need to build your own monofilament hand net. Remember to check your local fishing laws for using this type of net material. Some state laws prohibit the use of small eye net like this. In Hawaii you can have it, but only if you have an aquarium permit, which you can obtain when purchasing a commercial fishing license. A 12-inch wide x 30-inch long piece of 3/4" stretch monofilament net material. Razor blade or utility knife. 1 - 4" Brass Double Ended Clip (for attaching to your BC or some place on yourself at one end and your net on the other while swimming and collecting fish). Bend the rod to form a circle for your hoop then bend about two inches of the ends down, like prongs, to form the part of the hoop that will fit into your PVC handle. Cut two grooves on opposite sides of one end of the PVC net handle material wide enough to fit the rod stock into, making the notch about 1/2" deep. You can do this with a hacksaw. On the other end drill your hole for attaching the net handle to a clip while swimming. You can thread the net material onto the rod stock hoop two ways. Fold your piece of net material in half, sew up the two sides of the net to form your bag or pocket area. Thread the open end of the net onto the rod stock by catching each eye. Or you can thread each top end of the net material onto the rod stock before sewing it and once threaded onto the rod, sew up the sides. Slip the two-pronged ends into the end of your PVC net handle material where you cut out the two notches. Tear off some stripes of duct tape about eight to ten inches long and tear them in half lengthwise. Wrap the duct tape around the net handle and the net hoop in various directions and in a crisscrossing method to secure the handle to the hoop. Take your piece of clear tubing and with a razor blade or utility knife slice it open on one side the full length of the tubing, in as straight a line a possible. Spread the tubing and wrap it around the net hoop after you net is attached forming a covering with the opened part to the inside of the hoop. It will prevent the hand net from snagging on your collection net when catching fish. You now have your own do-it-yourself hand net. 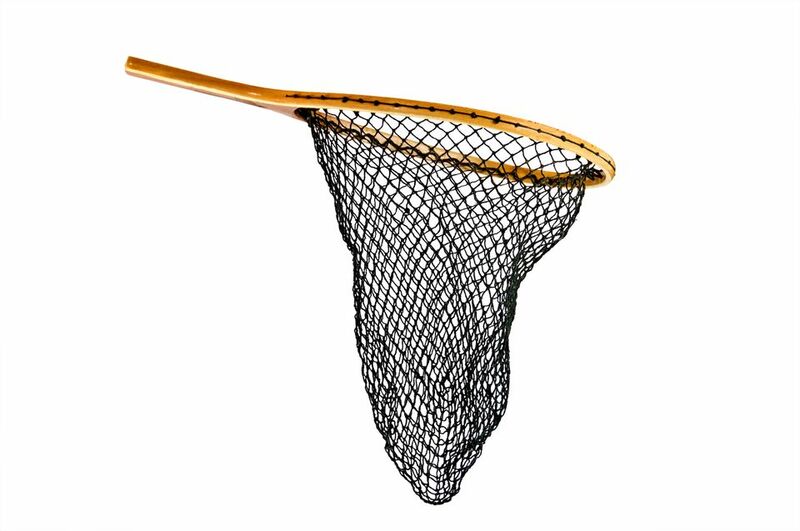 Another option you can use for building your net is to buy the red mesh nets with the wooden handles. Cut the red net material off, make your monofilament net pocket like above and sew it onto the hoop. This way you already have a pre-built net handle and hoop, you just need to add your own net pocket and trim off the length of the net handle, so it's not so long it gets in the way. You can drill a hole in the end of the net handle if you choose, or you can clip the net onto your net clip hanging it from the hoop end. Get some clear tubing that will fit around the hoop stock for covering, and you're set. Hands nets are not only vital to have for scooping the fish out of the collection net area. Remember RuleTwo from our Introduction? It was, do not pick up anything with your hands unless you know what it is, that's what hand nets are for. Many types of shells, sea urchins, fish, and other marine animals sting, so beware. Equipment wise, you are ready to go. Now comes the fun part, learning about how to capture, decompress and transport the fish you are going to catch.